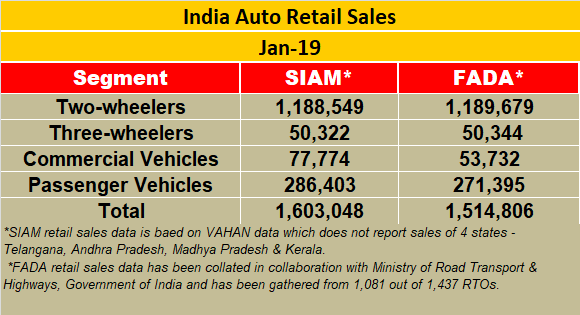 The Society of Indian Automobile Manufacturers (SIAM) today released the overall industry sales numbers for the month of January 2019. And, at present, the growth scenario looks bleak. The passenger vehicle, three-wheeler and two-wheeler segments are all down with only the commercial vehicle segment keeping its head above water. The PV segment saw total despatches of 280,125 units, down 1.87 percent over year-ago numbers. A clue that it would be this way came earlier in the month when market leader Maruti Suzuki India reported marginal growth. Both cars and UVs have taken a hit last month. At 179,389 units sold, cars are down 2.65 percent YoY and UVs down 3.57 percent with 82,772 units. Vans, though, with 17,964 units, are up 16.93 percent. The CV sector, which not too long ago, was chugging along at a decent pace of growth, has also felt the pressure of a poor market sentiment, the revised axle load norms which have eaten into new purchases of heavy-duty trucks and stagnant demand. At 87,591 units, the CV segment sees 2.21 percent YoY growth, comprising 34,456 M&HCVs (0.74%) and 53,135 LCVs (3.19%). According to Mahindra & Mahindra, the de-growth in the M&HCV industry is primarily due to the implementation of new axle loading norms, which created surplus capacity in the short term, resulting in reduction or temporary suspension of fleet purchase plans by transporters. Three-wheelers sold a total of 54,043 units, down 13.59 percent. 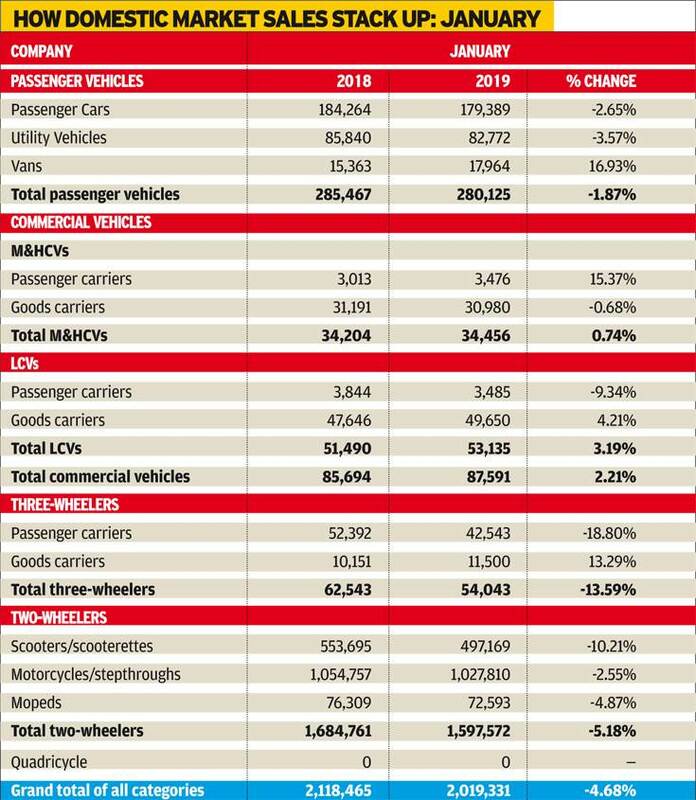 While goods carriers continue to see demand, passenger carriers are down substantially by 18 percent to 42,543 units. The two-wheeler market has been badly impacted. Overall numbers at 1,597,572 units are down 5.18 percent. While scooters are down 10.21 YoY to 497,169 units, motorcycles at 1,027,810 units are down 2.55 percent. Demand for mopeds too is down.